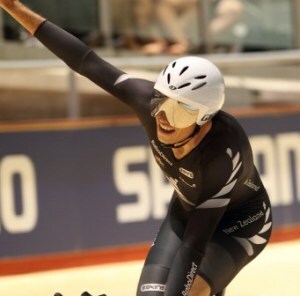 Saturday had some living up to after Good Friday turned in to great Friday for the Southland sprinters - Eddie, Matt and Tarsh all qualifying with new personal bests, all of which were new fastest times for a New Zealander ever. It didn't disappoint with an outstanding ride by Wes Gough to earn his second podium of the championships in the IP, the climax of the Men's Sprint (if Sir Chris Hoy calls it the great sprint competition ever, who am I to argue) and a dramatic points race with that hammer Aaron Gate earning honourary Austalian citizenship - but more on that later. Firstly came a late breakfast on Southbank with DT, Stu and DT's Uncle Merv. It was late mainly due to Stu and Dale's complete inability to coordinate their meeting point. Apparantly meeting at a bridge on SouthBank means you could by at any one of about four points. But eventually they hooked up (figuratively and literally I guess) and somehow successfully navigated their way to the restaurant I had been sitting at for 45 minutes. Fortunately Steve Canny and Ron Cheatley kept me company with some ripper yarns whilst I waited. Luckily the Eggs Benny was worth the wait and fueled up, I left DT to get lost heading to the Melbourne markets and Steve and I hit the MCG and the National Sports Museum. We took a stroll back to the 'G on the south side of the river where their were bikes and boats everywhere. 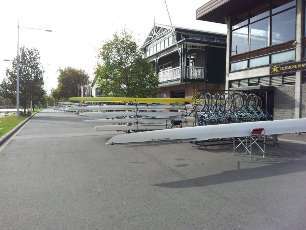 Melbourne's vibrant rowing scene sits along the Yarra's south bank and it was one busy place on Easter Saturday. Steve was the kid in the candy-store having previously rowed the Yarra and the Thames. We were both like kids once we reached the Sports museum. Unfortunately we only had 90 minutes, when I could have taken three times that. It is truly an incredible facility. The Australians have got a lot of collatoral to display, courtesy of their rich sporting history but they could not have done it better. So many wonderful stories, superbly told and some great fun elements as well. Cricket plays a large part with some outstanding memorabilia, a 3D hologram of Shane Warne telling the stories of his career (including him refering to himself as a fat b**tard - classic!) and a chance to pretend to be an umpire and rule on third umpire run-out decisions. 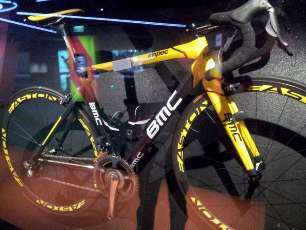 The MCG itself and the Melbourne Cricket Club which operates the facility each has its own section, as does the Melbourne Cup (complete with Carbine's skeleton), Cadel Evans' Tour De France-winning weapon, Australian Rules and the Olympics. There are listening posts through the whole facility where you can hear a three to five minute overview of that particulalr exhibit, often including the subject speaking in his or her own words. Then comes an incredible area for the youngsters (and not so young) where you can complete various virtual sporting challenges - from track cycling to aussie rules to football, cricket and archery. Brilliant and for $20 it's outstanding value. Put it on your list if you make it to Melbourne. Another coffee and nine dollar sandwich later, we were ready to hit the Hisense Arena for the penultimate day of competition. Today was a team focus for us, hitting up those in attendance, looking to confirm numbers and teams. The feedback, as previously mentioned, has been really positive. Team attendance is about the only thing we can't really control. All we can do is be as proactive with the contact and quality of information to international federations and we were pleasantly surprised by the number who were able to give us direct indications. Somewhat ridiculously, the latest teams can enter Junior Worlds is ten days before competition! Obviously from a planning point of view we need a significant amount of information well before then. UCI has been great in assisting with us, pushing the case at the Manager's meeting, personally guaging interest and they will also be contacting each of the federations by official communique to urge them to support the event. We have strong indications from 27 countries with many confirming numbers overt he next four weeks, now that the Elite Worlds are done. You will know this already, but Steve Canny is an absolute master at a job like this. His ability to be able to communicate directly and appropriately with such a diverse group of people as those crammed in to the pit area in Melbourne was something to behold. Our information packs (even if they did break my back lugging them around for most of the week) went down well and follow up from our personal contact will now be a priority. On the track the qualifying session was highlighted by Westley Gough qualifying in fourth spot behing three Aussies and in front of GB's Geraint Thomas in the Individual Pursuit. Tarsh Hansen drew a super tough heat in the keirin with Anna Meares and Germany's Team Sprint World record holder Kristina Vogel winning through to the semis. No surprises to see Tara Whitten, Sarah Hammer, Laura Trott and Annette Edmondson take out the top four spots in the Omnium IP and then Tarsh missed out on qualifying for the keirin semis with a third place finish in her repechage. For the only time at Worlds there was an official function between sessions which we were invited to attend with BikeNZ, a presentation by a delegation from Minsk, Belarus - venue for the 2013 World Championships. They did a very good job and they spared little expense. The Minister for Sport, Minsk mayor, President of Belarus Cycling and a national TV host were all in attendance to push the case. 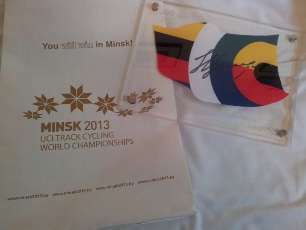 Everyone was presented a gift bag which included a signed miniature rainbow jersey from multiple World Champion Natalia Tsylinskaya - announced like Oprah ... "you've all won a car to take home!" Things got even better with a huge buffet meal and a decent amount of Belarussian potato juice, more commonly known as vodka for us all. The night of racing was a cracker. Gregory Bauge was a class above the rest, seemingly cruising to victory in the Men's Sprint from Jason Kenny who won the battle of Britain in the semifinal over a always-gracious Hoy. Aussie Glenn O'Shea put a target on his back for the Olympics, winning the Omnium over Zach Bell with Shane Archbold finishing strongly with a 3rd in the Scratch race and 4th in the Time Trial to finish in fifth place overall. No shock to see Anna Meares claim yet another world title in the Women's Keirin but our own Wes Gough did create a bit of an upset to come from behind to beat Rohan Dennis and take bronze in the IP - that was a great ride and deserved some of that Belarus Potato juice! But perhaps the ride of the night came from the ANZAC pairing of Cam meyer and Aaron Gate in the Men's Points race. Just over 20 laps from home the two took off and were able to take a lap on the field. It was thrilling stuff as the laps ticked down and we wondered whether they were going to make contact in time. A brilliant ride by Gatey, which ultimately saw Meyer take gold and Aaron finish just a couple of points outside the medals in fourth. So, one day remains. We've achieved a lot but there's more work to do tomorrow and hopefully more to add to the Kiwi medal tally on the track.